Home > Resources > Backup Samsung > How to Backup Samsung Galaxy S9/S8/S7 on Computer? Samsung fans must have the latest Samsung Galaxy S9/S8/S7 in hands, right? If you are planning to transfer all data from your old device to the new Galaxy S phone, it is always important to make sure the safety of the data first. There are many situations can cause the data loss on your Galaxy S9/S8/S7so it is necessary to back them up on computer. Below we will go over a quick and easy way for you to backup your Samsung Galaxy S7 or S7 Edge. The highly recommended Samsung backup tool is Coolmuster Samsung Manager, which is free to download and enables you to backup apps, photos, videos, music, contacts, text messages, books and more from Samsung Galaxy S9+, S9, S8, S7, S7 Edge, S6, S5, S4, Note 8, Note 7, Note 6, Note 5, Note 4, etc. to computer. It also equipped with data transfer and erase option that let your better manage your Samsung Galaxy S7/S7 Edge. Below are the buttons for you to download and install the free trial version of Android Assistant on your Windows/Mac. After downloading, set it up according to the tutorial in the below. Read more articles: How to Backup and Restore HTC Phone? Step 1. Run the program on your computer when installation finished. Connect your Samsung Galaxy phone to the computer through USB data cable. Once it is connected, the program will detect the phone and display it in the primary window. Step 2. 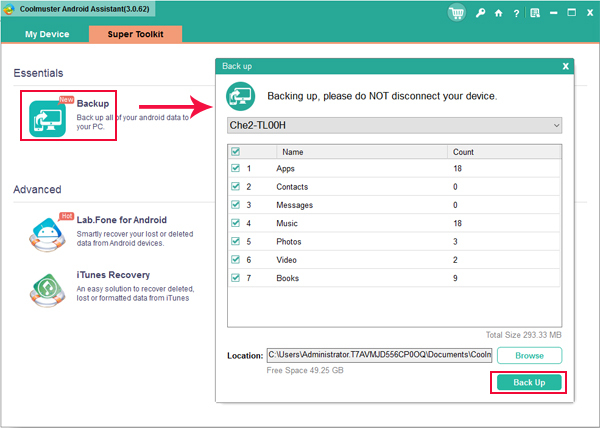 Click the Super Toolkit option from the top menu and click the tab of "Backup". Then, all files that can be transferred on your Samsung Galaxy are listed here for your choice. Step 3. Select the file types you want to backup and click the "Back Up" button. You can also click the button of "Customize" to specify the output location to save the backup files. 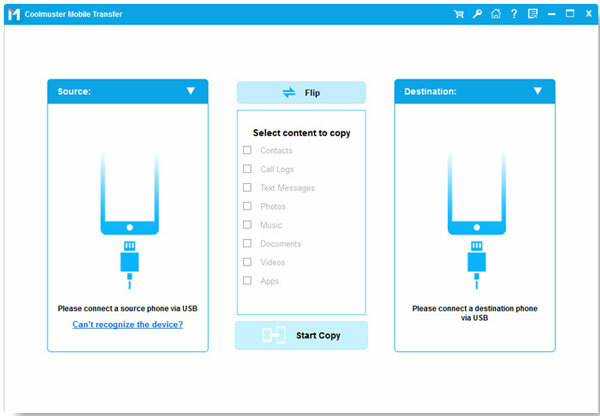 A professional phone to phone transfer program like the Coolmuster Samsung Transfer, can also allow you to backup your Samsung Galaxy device on computer with one click selectively. It transfers contacts, text messages, music songs, photos, videos, apps, and etc. smoothly and effortlessly from your phone to computer without any quality loss. Download the free trial version of the Samsung Transfer and read the following guide to see what an easy job to backup Samsung Galaxy on computer by using this program. To start with, download and install the SamsungTransfer on the computer. Launch it to show the primary window on the computer. Choose the "Back Up Your Phone" mode. Use a USB cable to connect your Samsung Galaxy phone to the computer. The software will detect it and show all the transferable file types on the interface. Tick off all the files you want to backup and finally, you can give a click on the Start Transfer button to begin the process. 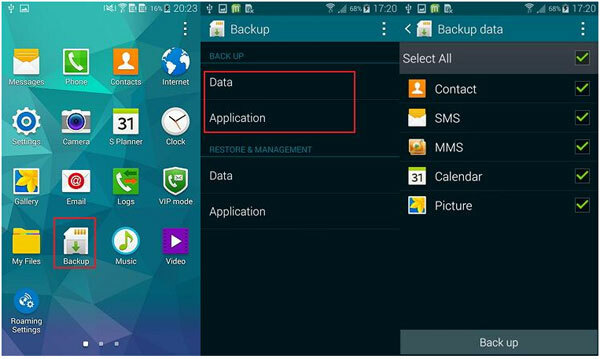 Actually there is a built-in Backup app on your Samsung Galaxy S9/S8/S7, with which, you can backup apps, contacts, SMS, MMS, calendar, call logs and pictures from your Samsung Galaxy S9/S8/S7 to its SD card. Step 1. 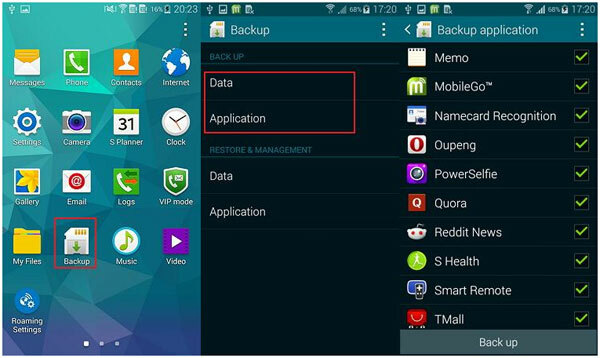 On your Samsung Galaxy S9/S8/S7, tap Backup app to Backup Samsung Galaxy. Step 2. In the backup section, tap Data. 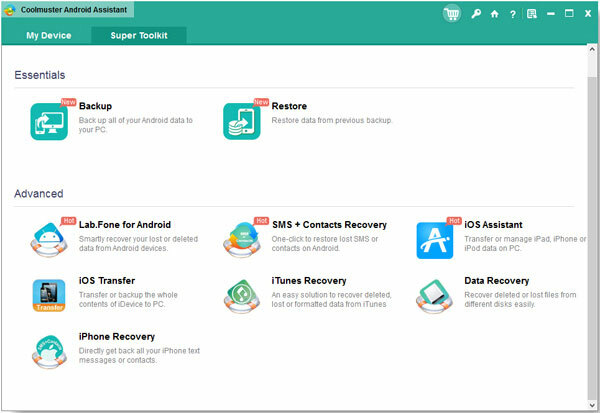 In the next screen, select the data you want to backup among the contacts, SMS, MMS, calendars, pictures and call logs. Then, tap Back up. In the pop-up dialog, you can name for the backup, otherwise, the backup will be named as the time you backup. Finally, tap OK and the backup file will be saved on the SD card in your Galaxy phone. Its save path is Phonect_backupackup_all. Step 3. If you want to backup apps, you can go back to the backup main screen, tap Application in the backup section, choose apps you want to backup and tap Back up. As we all know that media files like music, video, photos and document files are generally saved on the SD card of Samsung Galaxy S9/S8/S7. Thanks to Android open nature, we can access the SD card easily and of course we can transfer these contents from SD card to computer without any additional software but a USB cable. Read the following the guide to see how to backup Samsung S7 to PC. Step 1. Pick up a USB cable to connect your Samsung S9/S8/S7 to computer. Your computer will detect the connected Samsung device and display it as a flash drive. Step 2. Go to Computer and find your Samsung device. Double-click to open it. Step 3. 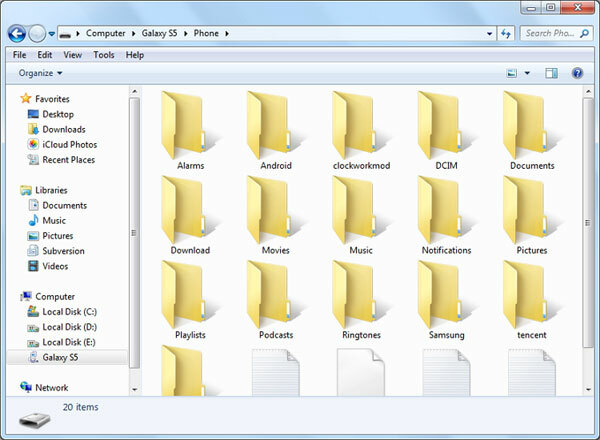 Find the folders that contain the files you want and copy them to your computer. By default, music, video and photos are saved in Music, Playlists, Movies, Pictures folders, corresponding folders, as well as folders created by yourself. Documents are where you save them.